OTTAWA, Canada -- Hinting at how close Canada has come to providing lethal aid to Ukraine in its war against Russian-backed separatists, Defence Minister Jason Kenney said Thursday that he recently ordered a military inventory to determine what weapons Canada could send to the Ukrainian army, if it chose to do so. Defence Minister Jason Kenney speaks at a press conference for procurement of new naval vehicles on Tuesday, June 23, 2015 in Ottawa. The answer that came back was: not much. Until now, the official reason Canada has hesitated to arm Kiev has been concern that such a move could inflame the conflict in the east of the country. Mr. Kenney revealed that another hurdle is the Canadian military doesn’t have appropriate weapons to give. “We do not have surplus military kit sitting around in our storehouses that we can ship over to Ukraine. I actually had our military do an inventory of possible equipment, just to prepare for all eventualities. The conclusion is we just don’t have useful, operable equipment that we could send,” Mr. Kenney said, speaking after a meeting of the NATO-Ukraine Commission at the military alliance’s headquarters in Brussels. A Ministry of Defence official said the inventory of weapons “either scheduled for divestment – or currently in use but scheduled to be divested in the near future” was carried out in February and March of this year, shortly after Mr. Kenney took office. Mr. Kenney said Ukrainian Defence Minister Stepan Poltorak used Thursday’s meeting to make the same point, again asking the alliance to provide his country with weapons. Part of the problem is that the Ukrainian military still uses Soviet weapons systems, meaning that most armaments Canada could send would not be interoperable with the guns and equipment the Ukrainians use. Mr. Kenney said that if Canada did decide to help arm Ukraine, it would involve purchasing weapons that fit the Ukrainian systems. “It would essentially be us through one of our partnership funds, helping to procure equipment for them,” he said. So far Canada, like most NATO countries, has proffered only non-lethal aid, such as uniforms and night-vision goggles. Canada is also providing satellite imagery to Ukrainian forces fighting the Kremlin-backed insurgency in the Donetsk and Luhansk regions. This summer, 200 Canadian military trainers will arrive at a base in the far west of Ukraine, where they will help prepare new conscripts for the urban warfare being fought in the east of the country. 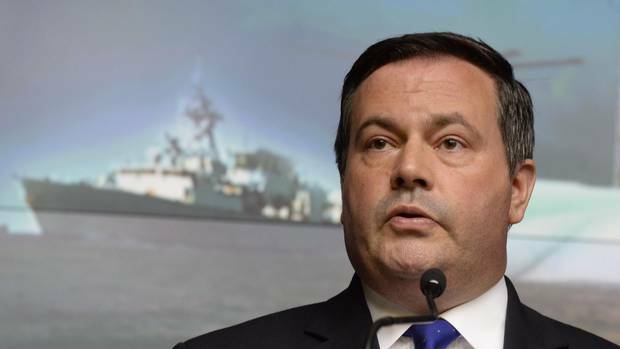 Despite the overt support for the government in Kiev, Mr. Kenney said Canada didn’t want to act alone in providing armaments to the Ukrainian military. The biggest barrier remains a fear shared by many within NATO that supplying the Ukrainian military with weapons would spur Russia to increase its own involvement in eastern Ukraine. “Obviously, even though we are very forward-leaning in support of Ukraine’s territorial integrity, we and our allies do not want to escalate the conflict,” Mr. Kenney said. So far, Lithuania is the only NATO member that has acknowledged supplying arms to Ukraine. Olena Prystayko, the head of the Ukrainian Think Tanks liaison office in Brussels, which lobbies the European Union, as well as individual governments, to help Ukraine, said several other governments had indicated a willingness to provide weapons to Ukraine if they saw evidence Moscow and its proxies were trying to capture more territory. The red line for several governments, she said, was the strategic port city of Mariupol, which is currently under the control of Ukrainian forces, about 20 kilometres from the separatist front lines. Mariupol is seen as key because its fall would make it far easier for the pro-Kremlin armies to connect with Russian forces stationed in Crimea, which Moscow seized and annexed from Ukraine following a controversial referendum there last year. “If Mariupol is taken by Russia, it would completely change the whole situation,” Ms. Prystayko said. “Russia continues to support the separatists with training, weapons and soldiers. And it has large numbers of forces stationed on its border with Ukraine,” Mr. Stoltenberg told a press conference. Both sides accuse the other of violating the Minsk ceasefire on a near-daily basis. More than 6,600 people have died in the year-old conflict. Russia has consistently denied that it has provided direct support to the separatist armies, claiming that video and satellite evidence of its involvement has been falsified by Western intelligence services. The Kremlin says the conflict in the east is a popular reaction to the rise of a “fascist” government in Kiev. Moscow also alleges that a 2014 revolution that overthrew the elected government of Viktor Yanukovych was backed by Western governments. Mr. Kenney flies from Brussels to Kiev on Friday, where he will meet with both Ukrainian President Petro Poroshenko and Prime Minister Arseniy Yatsenyuk. While in Kiev, Mr. Kenney said he will announce a “bundle of relatively small projects” aimed at improving the country’s governance. He will also travel to the western Ukrainian city of Lviv to meet with 40 Canadian personnel who are deployed there now, preparing the ground for the larger continent of trainers this summer. Mr. Kenney said that, even after a year of fighting, the Ukrainian army still badly needed the kind of training the Canadian military can provide. “Quite frankly, what we are hearing from the Brits and the Americans who are a little bit ahead of us in the training operation is just how unprepared and – I’ll put it politely – modestly trained the Ukrainian troops seem to be. There is a lot of very basic military tactics that they’ve never been taught.